The Catana yard in the Catalan region of southern France has been building 47-foot cruising catamarans for more than a dozen years. The newly redesigned Catana 47 incorporates more carbon fiber than its predecessors and springs from an entirely new hull and deck mold, but retains the same distinctive profile, tall twin daggerboards, open helm stations and performance-oriented rig. Catanas are built light and strong, with Twaron aramid and carbon fiber used extensively in highly loaded areas of the vinylester/polyester laminate. All the parts are vacuum-bagged during construction, and the hull and deck are both cored with closed-cell foam. Even the interior joinery, which appears to be solid maple, is made of cored laminates. The company says it has reduced the weight of the 47 by about 1,500 pounds. That translates to more speed and/or greater carrying capacity. It also permits the use of 40hp engines, instead of the twin 50s of the earlier model. 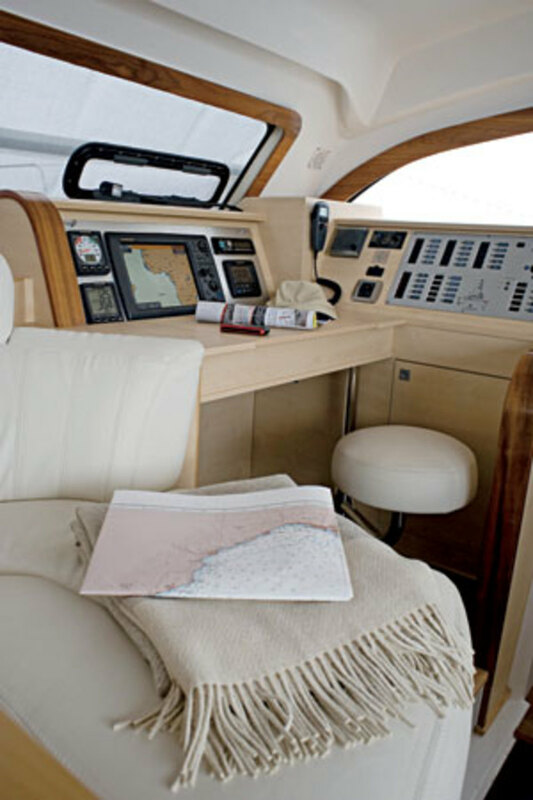 The engine rooms in the aft ends of the hulls are spacious enough to accommodate a genset and a watermaker. The onboard systems are neatly installed and meet CE requirements, although these do not specify tinned wiring, which is an American standard. There is a lot of deck and cockpit space aboard the Catana 47, so working crew and guests will not have to worry about getting in each other’s way. The two exposed helm stations move the helmsman out of the social area, while the single central winch handles all the sail control lines. These lines, however, are pretty closely grouped, so hauling on any one line calls for first clearing the winch and then locating the line you want from among those in the large bank of clutches. The main also has a bridle with two separate sheets, both of which must be trimmed for a course change. It’s all optimized for tweaking, but not simplicity. I also discovered there is a blind spot from the helm to the diagonally opposite bow. The skipper will therefore need a crewmember on watch to port when docking because the engine controls are on the starboard binnacle only. I really enjoyed the comfortable helm seat and the fact that I could see the engine instruments without having to crane my neck. There’s plenty of space belowdecks, with a light color scheme and expansive windows to emphasize this fact. It’s quite pretty and will accommodate a multitude. Headroom is excellent everywhere. Open spaces, however, do call for good grab points, and the Catana 47 could use more of them. If you are tall you can reach the overhead rails, but it was a stretch for me (I am 5ft 8in ) and my 5ft 2in wife was like a hapless ping-pong ball when the conditions got rough. The seating looks more comfortable than it feels, at least for me. The cushion material is very resilient, so one sits on it rather than sinking into it. The seat and back proportions are best suited to taller sailors. The entire starboard hull was devoted to the owner, and it is a pleasant space indeed, with a full double berth and a vanity table aft, plentiful lockers amidships and a big head compartment with a separate shower forward. All are separated from the rest of the boat by an attractive, curved sliding door. The port hull has a single berth forward and separate twin berths aft. It will be easy to get in and out of these twins from the center aisle; making them up in the morning will also be simple. It’s a very practical design. The two heads for these cabins do not have showers. Perhaps it’s an illusion, but the hulls of this new boat feel wider and more spacious than on the previous models. These private accommodations should not make anybody claustrophobic, as some multihulls do. This is the third 47-foot Catana I have sailed, and it feels different from the earlier models. The nice helm response is still there, but the boat is quicker. Since the earlier models had similar sail areas, the difference must be due to the new hull design and construction, the test boat’s “light ship” condition (my earlier sails were all aboard cruise-equipped boats) and the rougher sea conditions off Miami. Whatever the reason, this latest itereration of the Catana 47 accelerates faster and has a higher top speed than the earlier boats I&apos;ve sailed. I also found it has a very quick motion in a seaway that’s especially noticeable in the cockpit. The boat rewards good trim with immediate speed changes, making this a fun ride for avid sailors who enjoy playing with sails so as to get the most out of their boats. On a close reach in 9 knots of wind, the 47 yielded 7 knots of boatspeed, then ramped right up to 9 knots when the wind perked up to 12 knots in a gust. Tacking through 90 degrees was easy enough, as long as we did the maneuver briskly and avoided being stalled by oncoming waves. There was no sign of hull slamming in the waves; the nacelle and underbridge design seem to do their work well. Normally, one sails this boat with the daggerboards about halfway down. Raising them for downwind sailing reduces drag and makes this a fast sled for running in the tradewinds. The builder says the boat has topped 20 knots in ideal conditions with lots of wind. Like a nice cat should, the Catana 47 behaves beautifully under power. A low cruise setting of 2,200 rpm produced 7.4 knots at a very low (66 dBA) sound level. With the throttle wide open at 3,000 rpm, I measured a bit over 9 knots of boat speed. Not bad at all. The turning circle with both engines running forward was 1½ boatlengths, while differential power to the engines lets the boat spin in its own water. It stopped and backed accurately and was easy to handle in the crowded marina. 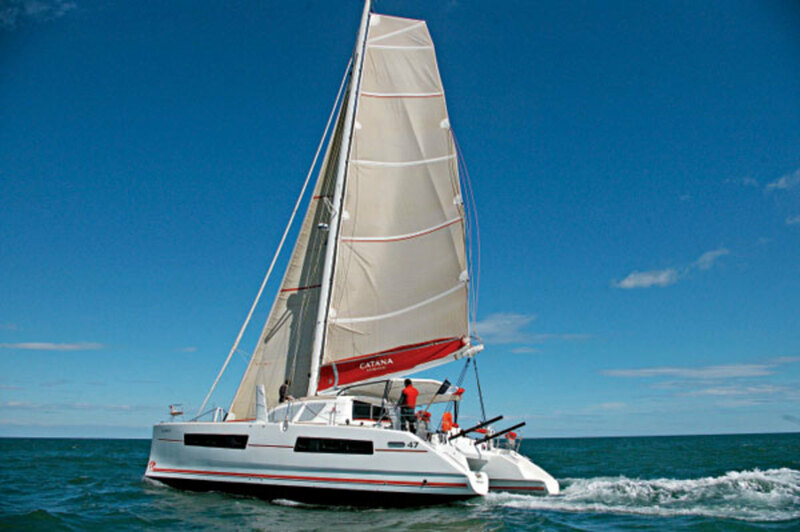 This latest evolution of the Catana 47 has had a testosterone injection while reducing its estrogen level. 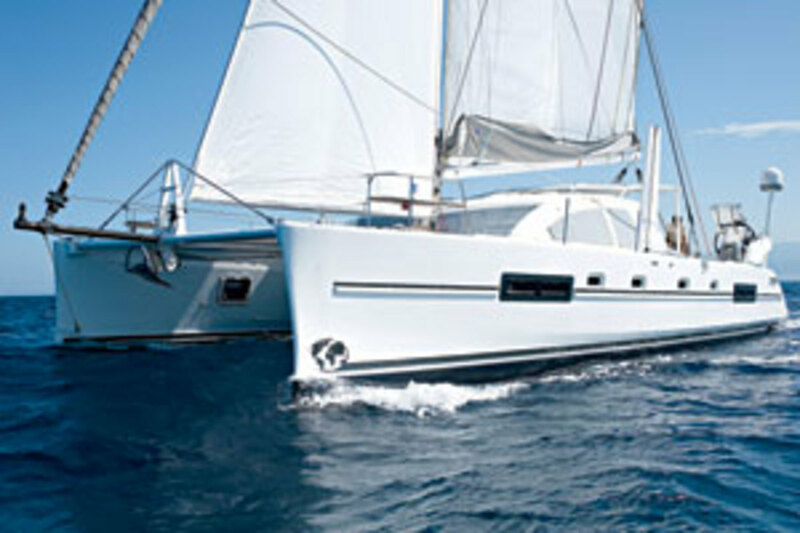 It’s quick, fast and exciting to sail and accommodates men well. Perhaps it is simply more French.